The Toronto Dingos will be heading to Guelph to take on the Grand River Gargoyles at 12 PM on Saturday June 3rd @ Margaret Greene Park (map). 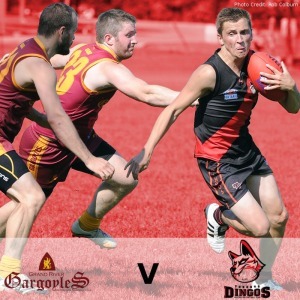 Last season the Dingos had a narrow loss (10.12-72 to 10.6-66) in Guelph in round 3 (match report). They will be keen to make amends this year to get their season off on the right foot. While a number of AFL Ontario round 1 games, including the Dingos clash with the Eagles, were postponed due to the condition of fields around the league Guelph were among the few teams who got a chance to play. They took on the visiting Central Blues and came away with a win 13.7-85 to 10.9-69 and will be keen to keep rolling. Should be a cracker! Following the game in Guelph the Dingos will be heading back to Toronto to host their annual Rookie Night at The Office Pub on John Street starting from 7:30 PM. Current and former players, friends, and family more than welcome.